The entire community is invited to celebrate Peoria’s All America City Award on Wednesday, July 10th from 5-7pm at the Peoria Civic Center. It will be a jam packed community celebration that you shouldn’t miss. We will be unveiling a new, yearlong community art initiative to “Build a Block” that will showcase Peoria’s All America City Award. It’s your chance to be a part of the permanent commemoration of this prestigious award. Those who attend the celebration on July 10th will be among the first to be involved. Members of the Peoria Chamber’s Young Professionals Organization along with the ELITE Pulses of Hope drum Line will perform “Peoria’s Story” just as they did to the National Civic League in Denver. You will get a chance to see firsthand why the judges said Peoria’s performance set a new standard for the All America City Award presentations. We will have the new Peoria All America City T-shirts, window decals and lapel pins on sale and you will have a chance to learn how local business can help promote and benefit from this national designation. 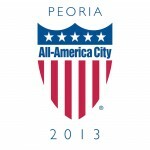 There will be free food, free parking and free entertainment so please join us to celebrate Peoria’s All America City Award on July 10th from 5-7pm at the Peoria Civic Center.